When Friday comes around and we have to come up with a £5000 car, we usually pick some sort of theme based in sensible, everyday reality. Shall we go for something practical, something luxurious or something with four-wheel drive to cope with bad weather? But this week we forgot about sensible and decided one cubic centimetre of capacity for every pound spent. 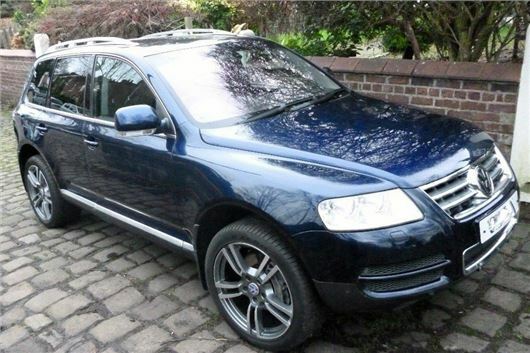 And so here’s our pick for this week's Five Grand Friday – a 2003 Volkswagen Touareg with a 5.0-litre V10 diesel. It’s really only 4921cc, so we have actually failed to get the true value for money we set out to achieve, but there is no denying this is a masterpiece of an engine - and one most people have never heard of. Peak torque is 750Nm, more than a current Lamborghini Aventador LP700-4, while peak power is 312PS. Towing capacity is 3500kg, which is the maximum permitted before you get into the world of commercial vehicles. But even if you filled your caravan with lead you’d probably forget it was hitched. Fuel economy isn’t exactly a strong point at 23mpg – and emissions are more than 300g/km – so this is not the usual, economy-focused, frugal choice of diesel engine. Thankfully the tank has a capacity of 100 litres, so you won’t have to spend each morning at the petrol station. In theory you can cover around 500 miles between fill-ups. The example we found is priced at £4995 and has covered 124,000 miles – which is about what you would expect of a 13-year-old car. Fortunately it has full dealer service history, which is pretty much essential given the complexity of the engine. Tt's reassuring too - in theory it means the owner has cared for the car, given the high servicing and repair costs. The drivetrain is all-wheel drive with a six-speed automatic transmission – so despite the colossal torque on tap, the V10 TDI is as easy to drive as any other Touareg. It looks like any other Touareg too – the fact it has such a monstrous engine is only betrayed by a subtle tailgate badge and some minor styling changes. The seller describes the car as “in superb condition inside and out” and it certainly looks good, though, as always, we recommend giving it a full check over in the metal. Pictures don’t always show imperfections very well. Inside there is four-zone climate control, black leather upholstery and wooden trim for the full luxury ambience. There’s also a sat nav system with TV tuner, an electric sunroof, front and rear parking sensors, heated and electrically adjustable seats, cruise control and even a power tailgate. The car currently has a private plate, but that will be removed and replaced by a standard plate when the car is sold. Full Volkswagen service history should reassure any potential buyer, but as used cars for £5000 go there are very few choices quite so potentially expensive when it comes to bills and servicing. But will we ever see anything like it again, given the current trend towards petrol cars and hybrids? Almost certainly not. So if you have some money to burn on an out-of-the-ordinary performance car, why not this? It’s almost certain to be considered a classic in years to come, so grab a slice of history before it goes to the great big, particulate-spewing diesel bonfire in the sky.